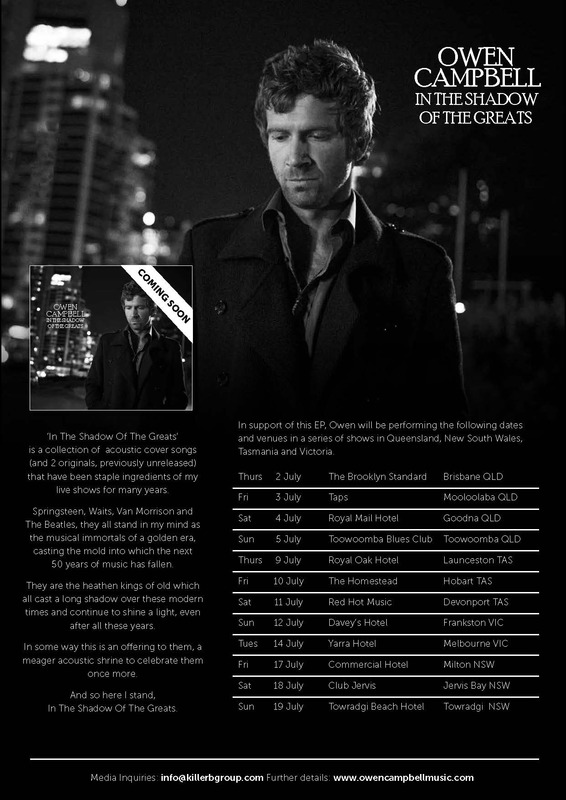 Touring Qld, Tas, Vic and NSW. I just saw you busking in Canberra. Got a copy of Pilgrim and I LOVE IT! You’re a legend! Owen, It’s me again. I really want you too see in Turkey you can make it I trust you so please let me know if you’ll ever think about it. Dude, come to England. Would buy a ticket in a heartbeat. Keep it up! Damn. Come to the UK. Please. 18 February, 2016/ 8 Adar I, 5776. Dear Owen, i have just experienced you, your music on that infamous AGT moment when the judges got the wrong end of the stick – not your fault – they took what you said personally – the only thing you need to learn from that is that your attitude is great – Australia is a nanny state, generally, so a free spirit needs to be able to say what you meant , Let’s enjoy the moment – (forget its a competition). That Brian guy’s behaviour indicates he has no idea what he’s there for. His arrogance was frightful – it’s not about the judges – he ought to know that he is not the centre-piece, you are – so your “school boy band” response was great, to the point, “yes boss” also hit the nail on the head and worse still was the fat man, Kyle, or whatever his name is – who also couldn’t absorb the intent of what you said because of his self-conscious ego, what a joke, and then mistress Danni poked her assessment of your personality in, about which she has no ability to judge – your personality shone through as independently minded, ready to make a joke, also took command of the stage, the audience and the judges, “let’s get this show on the road”, was commanding and straight to the point. You mean business, no time wasted. And you even apologised, and Brian didn’t give you time to explain yourself. Neither did Danni ask you what you said about the judges – her information was second hand from Kyle who didn’t understand the gist of what you said and his rephrasing of it was incorrect and showed he too had missed the point. Brian had the temerity to act as if he controls the road to show business. Worse still was the big fat man’s revengeful comment, that to his credit exposed the standard of journalism in Australia, which Australians tolerate and he obviously thrives on. What a disgrace! Thankfully from some of the comments I’ve read on their “attitude” indicates some Australians or those who commented still have that ANZAC spirit that gave this country character and made it great, whereas the Brian, whatever his name is McFadden, from Ireland – what’s he doing here anyway, is like those pompous generals who were responsible for so many lives lost on the beaches of ANZAC because they had no care nor contact with reality – they were simply “the judges” without a sense of compassion or ability. They too were so full of themselves, they thought they were superior, as if they were playing a game of polo. Australia has got talent, but fortitude, unfortunately, is not one of them. It’s a lucky country for bureaucrats, even to the extent that judges on Australia’s got talent are affected, that’s as bad as it can get, as judges in Tribunals, the Medical Board and judges in Australia’s courts (Vic and WA, Vic tribunals) are as bigoted and agenda driven too, by their own inadequacies and agenda-driven insufficiencies. The decision makers in Australia’s agencies of government are a sham. A touch of power is sufficient to bring out the worst in them. They could’t make it in private, as you have shown it is done. Finally i enjoyed your music, your unique guitar playing style reminded me of the greatest, Jimi Hendricks. You thrilled the crowd. I wish you every success, and would like to see you also as a panel judge to encourage young people to accomplish in the way that you have done through being focussed, yet humble and by enjoying life, and seeing the world from so many perspectives. Your donation to Nepal orphanage is a tribute to your stealth and life’s values. – Danni’s crack about your age and the hierarchy, just shows her values are up the creek. It was a side swipe to justify an unfair and unwarranted “No”. But it just didn’t work. The panel need to be dumped. If Australia’s “free minded” thinkers were listening or listen again, they would also have to say that Kyle’s remark “give the woman a chance to speak” was chauvinistic and rude to her as well as to the audience. This guy has so much baggage he made Brian’s ego look like simple childishness, while he and Danni had spite and “evilness” in their comments that are not justified anywhere, in public or in private. Their performance was a disgrace. Good luck, and keep on singing and playing your guitar with the magical star quality as have demonstrated you are able to. do “Good noW!”®. Congratulations, your performance is inspiring! Thanks for coming back to Australia, this county needs people like you to return, B”H, “Good noW!”®, 5776. Nooooooo, you already have been in Germany??????? Where and when????? Visit us in Boston. Boss you rock.